October marks the first anniversary of the 1 Million for Work Flexibility movement. Throughout the month on our blog, we are pleased to highlight a variety of perspectives from thought leaders in the field of work flexibility. 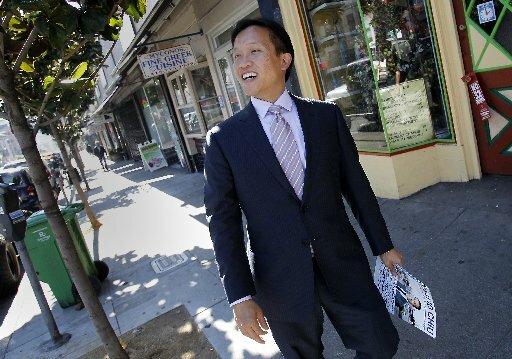 Today’s post features San Francisco Board of Supervisors President David Chiu. Under David’s leadership, the Board of Supervisors passed the Family Friendly Workplace Ordinance (FFWO) on October 8, 2013, and it went into effect on January 1, 2014. Under the FFWO, employees in San Francisco employed by an organization of 20 or more are legally allowed to request a flexible work arrangement to assist with caregiving responsibilities. 1MFWF: What sparked your commitment to/interest in flexibility in the workplace–what is your personal “aha” moment about the importance of work flex? David: Before I was elected to public office, I founded and ran an online communications company, which employed many people in their 20s and 30s. As they started to have children, some asked if they could work more flexibly, and our company made a decision to allow flexible work hours as long as work got done. We discovered that our employees who took advantage of flexibility were often our most productive and loyal. We found that our employees preferred to work at our company, rather than at workplaces that didn’t allow them flexibility to pick kids up from child care, soccer practice, and the doctor’s office, or to take care of sick spouses and ailing parents. As an elected official, I heard from hundreds of families that were having trouble balancing intense work-life pressures, in large part because the traditional breadwinner father and stay-at-home mother, which used to be the norm, is no longer the case. Today, many workplaces still haven’t adapted to 21st century family realities, nor taken advantage of new technologies that allow workers to work beyond traditional 9-5 hours. Last year, when I learned that countries around the world had successfully established the right to request flexible workplace arrangements and that Hillary Clinton and Barack Obama had unsuccessfully supported similar legislation when they were both U.S. Senators, I became very intrigued about whether San Francisco could lead on this issue. 1MFWF: What are the most effective ways employees have successfully requested work flex? David: The strength of our Family Friendly Workplace Ordinance is that it doesn’t prescribe a “one-size-fits-all” solution. Our goal is to provide employees with a safe space to make requests and allow for a conversation with employers to find solutions. What works in one situation may not in others, and our ordinance promotes creative thinking to address work and family needs. 1MFWF: Why have you advocated for legislation around the right to request flexibility, instead of just relying on companies and individuals to address flexibility on their own terms? David: We heard that while many employers believed they already provided flexibility, many employees didn’t feel comfortable requesting more flexible schedules. There is a documented “flexibility stigma”, the idea that asking for flexibility suggests that a worker is not committed to their job. We want to make it clear that these conversations should be supported, and to encourage employers to think about how they can better accommodate their workers’ needs. 1MFWF: How do you address concerns that legislation on this issue puts an unfair regulatory burden on employers? David: Numerous HR studies have shown that employees who are provided flexibility are more productive and less likely to be absent or turnover, which has improved the bottom lines of companies. Our legislation doesn’t dictate any particular outcome; we simply protect a worker’s right to ask. This legislation is considered “light touch” regulation, to nudge employers to consider different options, without requiring specific accommodations on the part of the employer. 1MFWF: If our readers would like to see similar legislation enacted in their districts, what steps would you recommend they take? David: Reach out to your local lawmakers and ask them to pass similar laws! Connect with local advocates and businesses about how flexible work arrangements have helped them, or how they would benefit if they had them. So many employees are juggling work and family obligations, whether one is taking care of a child, a sick spouse, or aging parents, and this is an issue that will touch almost everyone at some point in their lives. To learn more about the best ways to go about requesting flexibility from your employer, watch our webinar Requesting Telecommuting, Part-Time, and Flexible Arrangements from Your Employer featuring panelists Paul Rupert, a pioneer in flexible work and management for 40 years, and Jessica DeGroot, who helps employees follow a “third path” that allows for success at work and at home.